KISS gets a lot of stick for decisions they’ve made over the years, and some of that is deserved. One I always felt was uncalled for was the antipathy, and often downright hatred, for the song “Beth.” Those who discount that track from the mega-sales monster that was Destroyer conveniently forget a few things. The first is that hard rock was the province of FM radio and high schools. You could make a darn fine and comfortable life off of that in 1976 — just ask Led Zeppelin — but you were going to need to make some sacrifices to get to the highest echelon of the Top 100 singles chart. Also, in terms of content, Destroyer needed “Beth” more than the band would admit. The album was one constant rocker after another, filled with the lust and anti-authoritarianism you came to know and love about KISS. Producer Bob Ezrin, faced with one power rock track after another, needed a dramatic change-up, and while you can argue “Beth” was more melodramatic than anything else, it did the trick. And did it well, actually. Remember that the mid-1970s was cleaving two ways in Top-100 popular music: you were either moving to embrace the disco rhythms or you were going soft rock. During this time, Barry Manilow wasn’t just a star. He was a superstar. Let that sink in for a moment. Imagine the most popular artist today catering to the 25-and-up crowd, and Barry was bigger than them (adjusting for inflation). So this constant ire against KISS going with “Beth” is only pure logic. The trick worked. Cut to one year later and the original rock and roll maniac Alice Cooper drops the album Lace and Whiskey on his adoring fans. For many years the evolution of Alice Cooper was a show in and of itself. 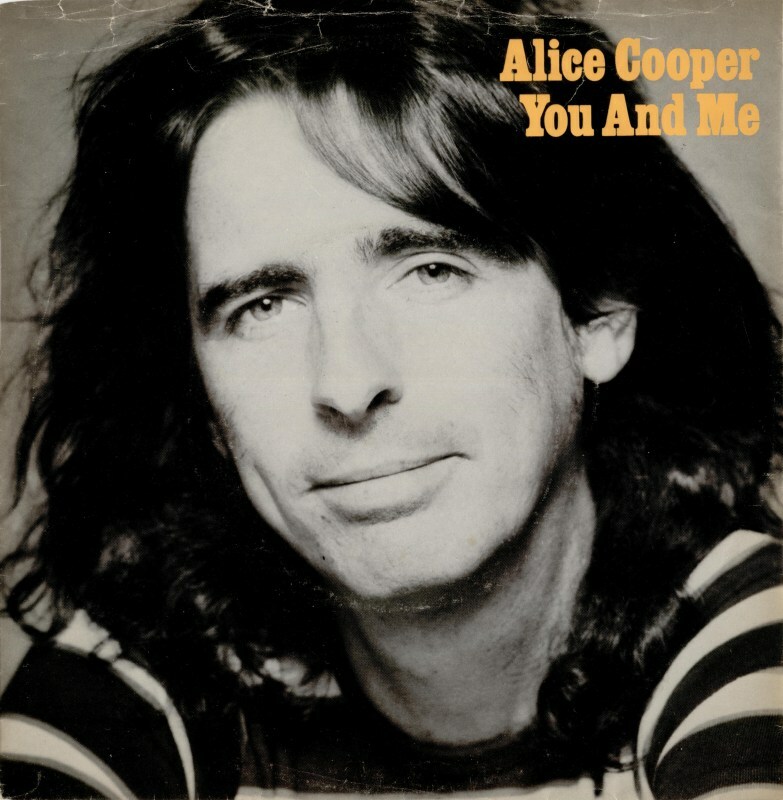 The Alice Cooper Band transmogrified from the bucket that contained the entire unit to the persona of the lead singer, formerly known as Vincent Furnier. From stage shows with boa constrictors and guillotines, “Billion Dollar Babies,” “School’s Out,” and “Welcome To My Nightmare” to…his “Beth” moment. “You and Me” is 1977. 1977 is “You and Me.” There’s no clear delineation between the two. The song had the soft string arrangements that wouldn’t have been out of place in a Chevy Chase and Goldie Hawn romantic comedy, or a truly weak sitcom positioned just before ABC’s Battle Of The Network Stars. Cooper, who by this time must have had a decent amount of cash to his name, sings lyrics aimed squarely at the jaw above the blue collar. “You and me ain’t no superstars, what we are is what we are, we share a bed, some lovin’ and TV…that’s enough for a workin’ man, ’cause what I am is what I am…” You get the idea. We don’t even need to get into what “I wanna…squeeze you ’till the passion starts to rise” is describing. Setting aside the possibility that Cooper has inhabited the character of Popeye serenading Olive Oyl, this working man narrative simply doesn’t jibe with Cooper’s previous rock golem aspirations. But I’ve found over the years that no matter how rich or famous you are, if you drop a few tokens of “commonality” down, people will buy into it. People still gravitate to Bruce Springsteen’s t-shirt and axle grease libretto. They howl with approval when Bon Jovi or John Mellencamp do it. And in hip hop, if the rapper isn’t bragging on how rich he is, odds are he’s detailing all the hard pimpin’ and pushin’ he did to survive the streets. It’s as fake as a four dollar bill now, and was as fake in 1977, but darn if it didn’t work. The link between Cooper’s sugary Cinnabon of a song and KISS’s goes deeper than just shock rockers looking for the top spot on Casey Kasem’s show. Bob Ezrin was formerly the producer of Alice Cooper and was even during his work on Destroyer. Casablanca brought him in based on his success with Cooper, if the biographies are correct, and the timeline indicates that he was working with KISS around the same time he was working on Welcome To My Nightmare. But we know “Beth” from AM radio, and I defy you to name a track from Nightmare that charted nearly as high. Ezrin subsequently worked on Lace and Whiskey and brought the winning formula with him. Now that, my friends, is downright Machiavellian.